The Arborist Advisory Committee is currently inactive awaiting the names of the committee members to be sent from the mayorʻs office to the county council for approval. Nominations for exceptional trees will then be considered. DO YOU HAVE A TREE ON YOUR PROPERTY THAT IS REALLY EXCEPTIONAL? Is it really old, or big? Is it rare? Endemic? Indigenous? Has an interesting cultural background? In a significant location or especially beautiful? Leave a green and growing legacy for our children’s children to enjoy. You can make sure that whatever happens to you or your property, your tree will always be protected. HOW? If you live in Hawai‘i County, ask us for details. We’ll help you through the whole process. Stop by our Pahoa office on weekdays or call 808-965-2000. LEAVE A LASTING, GREEN & GROWING, BEAUTIFUL LEGACY. PROTECT AN EXCEPTIONAL TREE TODAY! There is an ordinance in Hawai‘i County called "The Exceptional Tree Ordinance". Trees which are adjudged to be exceptional in terms of rarity, size, history, endemic status, beauty, etc. can be nominated for inclusion in this legislation and thus protected forever. We worked for several years to create and enact this ordinance. We continue to work to make sure it doesn’t fall through the cracks. Under this ordinance we saved the 601 Poho‘iki mangos and the 354 old growth mangos lining the Old Government Road from Wa‘a wa‘a to the 1960 Kapoho lava flow. This year we set our sights more mauka, to Ka‘ohe Homesteads at an elevation of about 1,200 feet. We nominated an ‘ohi‘a growing on private property. 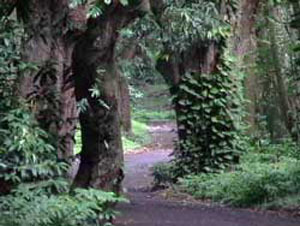 The tree has an 11-foot girth, yellow flowers, and harbors an ‘io (Hawaiian hawk} nest. It towers over the neighboring ‘ohi‘a, most of which have an 8-foot circumference. The owner, Bob O’Neil, wanted to make sure that no matter what ever happened to him or to the land, the tree would be saved. Now it will be. The listing process includes the filling out of a nomination form and presenting it to the Mayor’s Arborist Advisory committee. We do not sit on the committee, but we attend every meeting and share our thoughts. Some committee members are also members of MOP, so our input reaches friendly ears. Once the committee approves a nomination, it goes on to the County Council for three readings. If it passes, the tree is protected.